Bwahahaha. 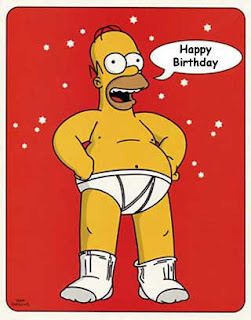 I went looking for a "Happy Birthday" picture and when I found Homer, I just had to post it. It cracks me up. LOL. I'm very fortunate to have 175(!) followers, over 20,000 hits and the opportunity to try new products and review them. This experience has done very little get my addiction under control. In fact, in the year I've had this blog, I went from about 30 polishes to almost 350! I swear, they are breeding. :P I've gone from being a slave to glue-ons to polish my own, albeit short, natural nails. Also, as I mentioned about a week, I'm having a giveaway to celebrate this event. After much hem and hawing, I decided to go with one or 2 big(ger) give aways. I'm heading to Sally's tonight to round out my prizes, so I'll know what I'm going to do, either 1 or 2 after that. :) Tomorrow, I'll probably post the contest information. Homer is so uncool, he's cool! That Homer pic is awesome! Congrats! I know what you mean about it being a great achievement. I am used to start things and never finishing them. Bad habit! I like your wrinting and blog! Thanks girls! It's been a crazy couple of days, so I've yet to take pics of my prize and create a post, but I plan to do it tonight. It's an awesome giveaway, if I do say so myself, and I can't wait to show you all what I've come up with! Congrats on your birthday. I'm glad you've kept up with this blog. I also like that we can keep up with your nail health.